The registration will begin on April 30 12:00 p.m.
開始售票 2017 年 4 月30日中午 12:00. The whole registration is expected to end on May 28 23:59 p.m.
其餘為 2017 年 5 月 28 日下午 11:59 截止. 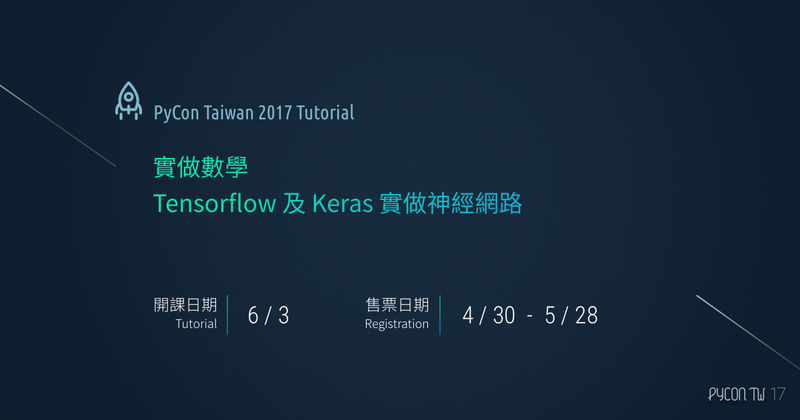 The tutorial will be held if there are more than 4 participants. PyCon will return full ticket price if the tutorial is cancelled. For those who bought the ticket without qualifacation above, PyCon will return the money with excluding the administration fee. Payment receipt will be sent over email. Please provide your Company Name and Unified Business Number. Except the condition above, there would be no refund once registration is confirmed.